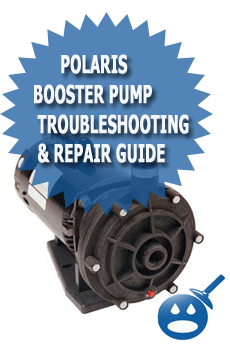 Before you can rebuild or repair your Polaris Booster pump you will want to make sure that it is not going to turn on or run while you’re working on it. The best thing to do is to manually shut the timer off and then disconnect the electrical cord from the outlet. This will ensure that your pump does not turn on while your working on it. If you do not have a timer you can just skip that step and make sure that the motor is unplugged from the power source. There are two different ways that your Polaris Booster pump can hook up to your swimming pool filter system. Some Polaris Booster pumps will hook up with flexible hoses and quick disconnect fittings and other Polaris booster pumps will be plumbed in using SCH40 or SCH80 PVC pipe. If you have a Polaris pump that is connected with flexible hoses and quick connects then disconnecting your pump will require no tools. What you will want to do is to “push down” on the quick disconnect collar and then slide the hose off the fitting. This can require a bit of strength as sometimes the hoses and the quick connect rings. The Polaris hose will sometimes be stuck as well and you will need to pull really hard to get the hose off of the quick connect fitting. If you have a Polaris pump that is plumbed in with rigid PVC pipe then you will need a pair of channel lock pliers. You will want to look for the union fitting that should be plumbed into both the Polaris feed and return line. You will need to turn the union collar counter clockwise to loosen. Once the union collar is loose you will want to spin the collar all the way off the threads and then the two parts of union (face and seat) will disconnect. You will need to do this on the feed and the return side of the Polaris pump. The front of the Polaris pump is the feed and then top of the pump is the return side. The Polaris booster pump is equipped with a drain plug that is located on the bottom of the volute. You can remove this drain plug by using an adjustable wrench and then turning it counter clockwise until it is removed from the pump. Once you remove this drain plug the water inside of the Polaris pump will drain out. Sometimes it’s also good to turn the pump upside down so that any addition water can drain through the discharge side of the pump. The drain plug is part #14 in the diagram below. Once you have drained the pump you will now want to remove the pump assembly, which is also called the of the pump. You will first want to remove the outer volute cover that you can see in the diagram below. If you look in the diagram below you will want to remove part numbers #1 and #9. These are the bolts that hold the volute cover on to the pump housing. Next you will want to remove the impeller and then the impeller housing, these are part numbers #2 and #5 in the diagram. Once you have removed the pump assembly / wet end of the pump you will be ready to start re-building or repairing the booster pump motor. In order to change the motor bearing in the Polaris motor, you will need to open up the motor and remove the motor armature. What you will need to do first is to remove the motor end bells. These are the front and rear covers of the motor. To do so you are going to have to remove the four through bolts that hold the front and back motor covers. Using a nut driver you can remove all four of the though bolts. You will have to turn the through bolts counter clockwise to loosen them. In some cases the heads of the through bolts maybe rotted away and this could prevent you from opening the motor. In such cases where the though bolts are rotted away to a point where you cannot remove them, it might be best to just change replace the entire motor. If the though bolts are rotted that badly chances are that the rest of the motor will be as well (rotted) and it won’t be worth fixing. But chances are your bolts are still fine, so you will want to use that nut driver to remove the four motors through bolts. Once you have removed the motor through bolts your next step will be to extract the electric motor armature that is inside of the Polaris booster pump. You will want to grab a flat head screwdriver and knock the motor ends bells (font and back covers) gently off of the motor housing. As you use the screwdriver and the hammer to tap off the end bells you will see that they will start to separate and then the end bells will come loose. Once this happens you will be able to slide out the motor armature. The Polaris motor armature is where the bearings that you will be changing are located. Once you have both the front and the rear end bells removed from the motor you will now want to remove the armature from the inside of the motor casing / windings. Once you do so you will be able to see the front and the rear pump bearings that you will be replacing. Now that you have the motor armature out you are going to want to remove the bearings and then off course replace them. In order to remove the bearings your going to need a tool called a motor bearing puller. This bearing puller will easily remove the bearing from the shaft of the motor armature without damaging anything. You can buy a motor bearing puller for around $14.00 and up depending on the name brand of the tool. Most auto part stores will lendout tools for free and this could be a great way to not have to buy the bearing puller if you’re not into having your own tools. If you have a vice on a workbench then you should put the motor armature into the vice, as that will make it easier for you to use the bearing puller as we describe below. Once you have your motor ball bearing puller you will want to put the tip of the puller in the center of the motor shaft and then take the two claw arms and attach them to each side of t he bearing. Once you do so you will want to start tightening down the threaded shaft on the bearing puller. Once you start turning the bearing pullers threaded shaft clockwise you will start to see the bearing remove from the motor armature. Keep turning the bearing puller shaft clockwise until the bearing is all the way off of the shaft. You will want to remove the front and the rear bearing. It is always best to replace both of the motor bearing when rebuilding the motor. If you choose to only change one, chances are the other bearing will soon fail and you will have to re-open the motor and do the above steps all over again. Its just best to replace both of t he motor bearings while you have the pump apart. To install the new motor bearing on the shaft of the motor armature you will need a bearing press tool. This tool is designed to fit over the shaft of the motor armature but also meant to press against the inner race of the ball bearing. What you will want to do is to gently place the bearing into position onto the motor shaft. Once the bearings are on the shaft you will want to slide the bearing press tool onto the shaft and let it lay against the bearing. Now you will want to take a hammer and knock the bearing onto the shaft with the bearing press tool. If you have access to an actual arbor press then you can also that to push the bearing onto the shaft as well, but most people don’t have access to an arbor press so the bearing press tool comes in handy. If you cannot locate a bearing press tool you can look for a socket that fits over the pump shaft but also matches up with the inner race of the motor bearing. Never press the bearing onto the shaft using the out race of the bearing or you could damage or destroy the motor bearing. By this point you should have both of your Polaris motor bearings changed and you will be ready to start putting the motor back together. You will want to re-assemble the motor in the opposite way you took it apart. You will first want to slide the motor armature back into the motor housing / windings. Next you will want to put the front and back end bells / motor covers onto the motor casing. You then will want to re-insert the through bolts and tighten them up evenly. After you tighten all the motor through bolts you will want to make sure that the motor shaft still spins freely. In rare cases, over tightening these bolts can result in a frozen or jammed motor shaft / armature. Once the through bolts are tighten, you will want to make sure to know replace or use the old water sling and install that back onto the pump shaft. The water sling is the rubber washer that sits on the motor shaft on the front of the motor to sling water away from the motor in case the mechanical pump seal leaks. Now that you completely have the motor back together you can get ready to put the wet end / pump assembly back onto the motor frame / housing. After rebuilding your Polaris pump motor you will need to install the wet end of the pump but we wanted to tell you to make sure that you change the mechanical pump seal. You never will want to use a seal that has been pre-used if you can help it. In some cases you can get away with using the old seal but in most cases the seal will leak after a short time and then you will just wind up taking the pump back apart to change the seal. The last step in overhauling your Polaris pump motor and pump is to reattach the wet end of the pump. You first will want to reattach the pump seal housing. After you attach the seal housing you will want to now screw the impeller back on to the motor shaft. Once you have the impeller on the motor shaft you can now put the pump housing cover / front side of volute back onto the front of the pump. The instructions look real easy and I just got the bearings from WW Granger for just under $9 each. (Granger stock number 6L025). They are double sealed bearings and size is 17mm(bore dia.) x 40mm(outside dia.) x 12mm(width). NTN is the manufacturer which is the same as the originals on the A.O. Smith B625 Polaris Clean Sweep pump motor that I have on the booster. The local auto parts store had them in stock as well for about $10 each. I’ll give it a shot this weekend and see how it turns out and if the noise reduces before I go buy a new motor. Hopefully I won’t have to. Appreciate the information. Yes, Granger is a great place and if you are handy, you can have a re-built motor for only $19 (2 bearings) like you said. With this economy its important to save money where you can, that’s why I write these articles. No reason to spend big money on a new motor when rebuilding is more affordable and just makes more sense! I also order the bearings and seal kit from a website with these pointers and instruction I hope booster pump will be good as new! Just want to ask what is the most important part of the rebuild. I don’t want to scratch my head later. Here is some feedback on the rebuild of my PB4-60 booster pump, B625 motor. Your instructions for the rebuild were spot on!…Just awesome! I had it all broken down, bearings pulled, replaced, and the whole pump put back in service in a 1 hour and 52 minutes….I timed myself….It’s running quiet, like a new one now. Definitely the bearings. Good call! I replaced the seals on the shaft and voloute. The only small problem I had was a couple of short screw heads broke off due to a little corrosion, but I was able to drill them out and replace them real quick with some of the like I have been keeping in the ole screw can forever. Oh, and I also got rid of the the permanent piping to the unit and bought the polaris flex line and quick connect kit before I started so that the next time it’s quick out and quick in. I had to modify the suction and return lines just a bit but it will be well worth it in the long run using the flex line. ‘Till next time….Thanks for the help Joseph! I am glad to hear that the pump is nice and quite now as well. Have a great Holiday and if you need anything in the future , you know where to come ! How do you separate part 2 from part 5? It looks like there is a nut on the shaft of the pump which extends through part 2 and a special tool is required to remove the nut or does one take a screwdriver and pry part 2 away from part 5? Part # 5 is the bracket and in my arrangement links the booster pump to the impeller and the volute. There is not a convenient location to grab the shaft other than through the bracket. However, the bracket opening is small so there are limitations on having a large enough wrench or apparatus to hold the shaft and to fit through the opening in the bracket. Do you suggest a pipe wrench or channel locks so as not to damage the shaft? There is a “trick” to this I should have mentioned. What you will want to do is to “pop off” the end cap on the backside of the rear end bell. Once you so that you will see that back end of the motor shaft and it will have a “slot” in it where you can grab or rather insert a large sized screwdriver to hod the shaft. Let me know if you need more help or if that doesn’t make sense to you. Thank you for your response. I am afraid I do not know what you mean by the rear end bell. There is nothing in the schematic of the PB-4 with that designation. On the impellar there is a nose cone shaped item which is attached to the motor shaft . It would seem like that nose cone should come off so the motor shaft can be separated from the rest of the components. However, how that is taken off is unclear to me. Do me a favor and take a picture of the back of your Polaris motor and send to it via email and I will edit the picture with arrows to show you what to remove. My polaris pump has just stopped working all the sudden. I have checked the impeller and it turns freely. When I flip the on switch it looks like the pump is trying to work but then quickly stops after about 1 second. My pump is not bolted down to the cement pad so when I flip the on switch it actually moves a little. So I know something is trying to happen. It’s like when you try to start a car that just won’t turn over. What could have happened is that your Polaris over heated and then the impeller melted and spun off causing the mechanical seal to jam the motor(I have seen this many times). If you are handy and you can repair things like this yourself then I would suggest taking the impeller housing apart to see wassup. I am sure you will find something, if not then my next suggestion would be to test the capacitor next. My pump is doing almost the same thing. When I apply power, it hums for a few seconds, and then the overload protection kicks in and it goes off. I’ve checked the wet side, and there’s nothing jammed (the motor turns freely). I’ve also checked the start capacitor, and it appears to be good. Great web site. Got home today and pump was running, just not as loud as normal. Zero water pressure coming through hose. No air or anything. I’m thinking impeller. What do you think? Pump is about 5 years old. No leaks or over-heating. Should I go ahead and replace the bearings or just wait till they go out? Thanks in advance! Mechanicl seal – is that the seal that I see at the back of the pump housing. 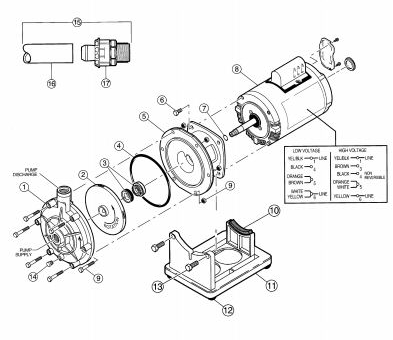 I don’t see this seal listed in the diagram…What is the part number or specs so Ican get a replacement. My initial problem – water coming out from the wet side in front, since I have this off I thought I would go ahead and R&R the bearings, thank you for having this site – awesome. By the way the instructions on this web site are awesome – very professional. I really appreciate your shaing your knowledge. Impeller removal – Holy smokes I have followed the insturctions and it seems that being 6’7″ weighing 275 (not fat) I still cant turn the impeller without damaging it – I am rotating the impeller counter-clockwise and no go, I have used penetrating oil and have let sit for at least three hours – still no go. MAybe I just need to get medevil with it and then go buy a new impeller….this thing is not coming off in one piece. With six kids I need to save money but geesh this dude looks stuck. Are you holding the motor shaft / armature? Have you tried using a strap wrench? The “mechanical seal” is part #3 in the diagram above, There is two parts to the seal. One is the ceramic base and the other is the spring with the seat. Mine’s squealing like a pig. Just curious – didn’t see you mention anything about dealing with brushes in the motor – is it brushless? Is it really just a matter of sliding the armature in and out? Yes, you can slide the Armature right out, Its a magnetic motor, no brushes. Well, I pulled it apart last night. Broke all four through-bolts about 2″ above where they screw into the rear “bell.” There is an electric motor repair shop near my workplace – gonna see what they will charge me for drilling and tapping and new bolts, but I think my motor is history. RATS! Getting a leak on the “wet side” of the pump. Right where the impeller rod goes into the housing. Also, pump does make some above average noise. Suggestions on what to repair/replace? I’m thinking mechanical seal? Bearings? Great website, very technical yet easy for the DIY’er! Thanks for the nice words about the website. You are correct, you will need to replace the seal and the motor bearings, which is way cheaper then a new pump. Bearing should be around $6 – $10 each and the mechanical pump seal is around $6 – $8. So, I need part #3 (mechanical seal), o-rings # 4 & #7, and the RTV silicone around rim of part #5? Also, bearings from where? Auto parts? Need the bearing press tool? Thanks for the help. Roger that. So, pump seal from the pool supply store? Suggestions on where to get the bearings? Auto parts store? Also, really need the bearing press tool? Any ideas as to what someone would charge to replace the bearings if I took them the motor? Thanks. You can get both at the same place if you have a “Grainger” near you, Although the pool supply store may sell the seal and the bearings as well. Got it all apart and cannot get to one of the bearings, too rusted out. Now I can’t get the through bolts to line up?? Any secrets or tips on how to line these up?? No secrets, just take your time and try to get them lined up. Great site – thanks. Taking my pump apart now, but I committed a mortal sin! I pulled the two wires off the back without remembering to mark which wire went where! AAAARRRRGGH! Can you tell me where the red and blue wires go on the back plate? Give me a hi pin/lo pin reference when looking from the back. Thanks in advance for the help. Awesome site. I have a question. My polaris booster pump was installed new about 90 days ago. Booster pump stopped working about 3 weeks ago. Pool company said that water and soil due to recent rains have damaged booster pump? How is that possible if the seal was properly installed? Could there be other causes? Was the pump sitting on a platform or was the pump sitting directly on the ground and then when the heavy rains came the motor soaked into the water? I would let the motor dry out for a few days to a week and then try it again. The motor windings could be soaking wet. The other thing is that if this pump was only installed 90 days ago, you should have some sort of warranty right? The equipment sits on a concrete slab. The bottom of the polaris booster pump sits about 4 inches above the concrete slab. There is about an inch or 1-1/2 inches of soil that washed onto the slab during the rain. I can see how water/soil could get inside if the pump had been covered or submerged, neither was the case. Just the normal heavy fall rains. The pump has been off and not working since Sept. 19 — if it were wet inside, it would have dryed out by now. My understanding is that the shaft seal (if properly installed and not compromised) is intended to protect the inside of the pump. So, I go back to the shaft seal — if infact water/soil is the problem. The challenge that I have is that the technican made this diagnosis based on a visual inspection. He did not take apart the booster pump, nor did he remove the housing — nothing. The warranty kicks in if the seal was compromised or if there was some other mechanical problem — but I don’t know what else to look for. Any ideas?